Aggression A Dirty Little Secret? You are here: Home / Animal Attacks / Aggression A Dirty Little Secret? Animal professionals take a calculated risk when they work with animals. Knowing you face the risk of an attack or death is a reality when it comes to working with wild animals but what about companion animals such as pet dogs? 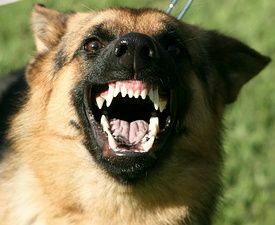 The biggest risk, believe it or not, involves the dog owners who keep aggression a dirty little secret. I’ve been pretty fortunate in my career to have been able to avoid serious injury and incidents by paying attention to animal behavior and stacking the cards in my favor. However, the only times I’ve had close calls have been due to owner failing to disclosure the fact that his or her pet had aggressive tendencies. In one situation, I was on a consult for a puppy. The owners had an older dog but never said anything about him being aggressive during our initial interview by phone, nor did they do so while I was on the premises. However, this dog lunged to attack me and I was fortunate to have my training bag to thwart the attack and use as a barrier. Now, I’ve made my living working in animal behavior & training for a long time and so that is a strong skill set–but there are other pet professionals that work with pets and that don’t have that knowledge to be able to deal with behavior problems–especially when they take them by surprise. Before I get into this a little more, I want to say to those of you who own a pet, you are responsible to disclose whether or not your animal is aggressive. This means if the animal has growled, nipped, tried to bite, or has ever bitten anyone–you are required to inform anyone who is going to be around your animal that there is potential for trouble. Failing to do so is a grave error that could cause injury, disability and even death. You are liable for the actions of your pet and it is your responsibility to make sure that you keep your pet safe and other living beings safe from your pet if he or she displays aggression. This doesn’t mean a pet professional won’t work with you, but it does mean that he or she will know to take safety measures to mitigate potential problems and so will be prepared if something does happen. For instance, not too long ago an animal jumped a pet pro from behind and managed to grab and drag the person by the scalp. As she tried to protect herself, the dog lunged at her face. Throwing up her limbs to defend herself–she was mauled. What she discovered later, the dog had attacked all members of the family. Now, when I was helping one of my colleagues with his practice, I was mortified by some of the incidences that happened within households. There were two dogs that attacked a toddler and ripped his ear off. When I asked another owner to disclose the last time their dog had bit someone, he put out his hand to show me puncture wounds that went through the hand–and said, “two weeks ago” but it was shocking to hear that bites were a regular event! Over the years, with few exceptions, I’ve not had a problem with people withholding information from me. Part of this is because I have a questionnaire that inquiries about growling, nipping, biting and other related activities. Plus, I also ask the pet owners directly AND in some cases, will also ask other pet professionals who work with the animal for their input. When I’ve asked non-trainer pet professionals about this issue, many discover that a cat or dog is aggressive when they insist that pet owners sign off on the issue. Honesty keeps others safe, and then an informed decision can be made as to whether or not the problem is manageable or not. If you are a pet professional, take the time to ask the tough questions and to do some exploration with new clients. Okay, so now I want to know–have you failed to disclose something about your pet’s behavior because you were embarrassed, afraid or ??? If you are a pet pro–have you faced the unknown due to non-disclosure? Please share your stories in the comments below. If comments are closed, take a moment to leave your note over on my Facebook community page.